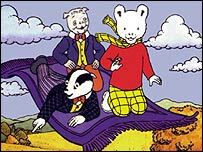 A museum dedicated to Rupert the Bear, which is the first of its kind in the world, has opened in Kent. The museum has opened in Stour Street, in Canterbury, because Rupert's creator Mary Tourtel was born in the city. She created the character for the Daily Express in 1920. Housed in two specially converted buildings, the children's museum adjoins the city's museum in the former Poor Priest's Hospital. It is part of the city council's ongoing plan to revamp the Museum of Canterbury. The front window of the museum has been created as a room for passers-by to look in and see Rupert and his parents having tea. As well as Rupert another classic children's character is also featured at the museum. Bagpuss, created by Peter Firmin and Oliver Postgate, who both live near Canterbury, can also be seen. On show are the original sets made by Mr Firmin for the television series, complete with the front window of Emily's shop. Janice McGuiness, council head of leisure and cultural services, said: "We are keen to mark Canterbury's wealth of literary connections - and some of the best loved children's characters including Rupert and Bagpuss, are very much part of the celebration of story-telling."